Venom is an anomaly for modern superhero films, existing outside a broader connected universe. The irreverent alien symbiote made its film debut in 2007’s Spider-Man 3, the year before Iron Man kicked off the Marvel Cinematic Universe, forever changing the way studios approach comic book adaptations. Though a few dozen superhero movies have come and gone between the Topher Grace and Tom Hardy versions of the character, Venom as a film seems to want to pay homage to the idea that a movie can exist as a movie without any broader ramifications for future team-ups down the road. Freed from shared universe obligations, Venom never seems sure what it wants to do with its time. The plot never really exists as more than an excuse to pair up Hardy’s Eddie Brock with the titular symbiote. Riz Ahmed plays a competent menacing villain in Carlton Drake, but the character lacks any compelling traits to set him apart from the “mad scientist” trope that defines his place in the narrative. Michelle Williams has a few standout scenes as Brock’s ex-fiancée Anne Weying, but largely feels wasted in a wooden supporting role created more out of obligation to give Brock more human characters to interact with than anything else. Venom shines when it lets Hardy run wild with his alter-ego. Venom is a hilarious character who develops an oddly charming buddy-cop romance with Brock as the film settles into its second act. The relationship produces a number of laugh out loud moments that serve in stark contrast to the film’s otherwise grim tone. Such mood-swings seem to define the entire experience. 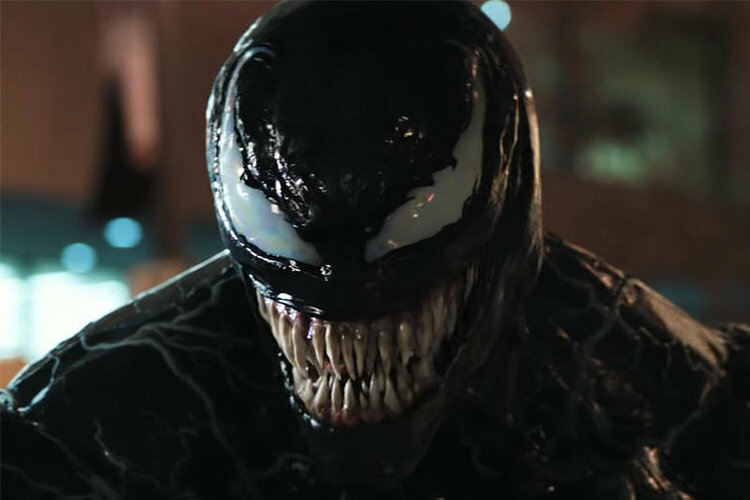 Like Brock’s relationship with Venom, the movie exists in constant turmoil between dueling desires to be simultaneously formulaic and spontaneous. The action scenes feel wooden, but there’s enough humor to make you wish you were enjoying yourself just a teensy bit more. Hardy makes the most of what he’s given as an actor, but the narrative is too all over the place to create a cohesive experience. Venom is a very fun mess to watch, but it would be a stretch to call it a good film. Which isn’t to say that Venom doesn’t have a place in the crowded superhero genre. The narrative is far more chaotic than any MCU offering and never as grim as a DCEU installment. Venom gets its titular character right, but fails to supply a worthy vehicle for him to play in. The film is perhaps best enjoyed in snippets on premium cable, where one can focus on the humorous elements while forgetting that movie doesn’t really know how to tell a story.